In 1821, Nicaragua gained its independence from Spain, and became part of the newly formed Mexican Empire. Subsequently it formed part of the United Provinces of Central America, which then became the Federal Republic of Central America, adopting a horizontal tricolour of blue, white, and blue. Based on the Argentinian flag. In the centre, the new coat of arms for the Central American Republic. Part of the national crest of the Republic of Central America included 5 volcanoes, each volcano representing one of the constituent nations in the republic. 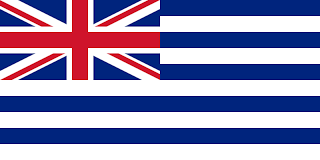 Part of Nicaragua was actually a British protectorate, known as the Mosquito Coast, and it used a blue and white striped flag, with a Union Jack in the upper hoist canton. In 1860, the flag was altered with the Union Jack being dropped in favour of a blue, white, blue horizontal tricolour with a golden emblem. 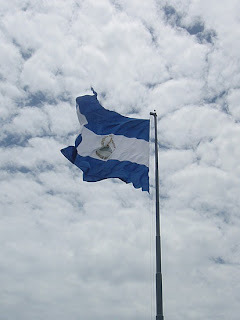 This flag was used when the Mosquito Coast became an autonomous part of Nicaragua. With the collapse of the Federal Republic of Central America, Nicaragua went through a period of relative instability in the mid 1800's, between the liberals, and the conservatives. In 1852, the nation used a new horizontal tricolour of white, yellow, and red. In the centre was a simple green image of a mountain. From 1854, to 1858, Nicaragua went from the conservatives to the liberals, who where led by an American, Walker, and backed by the US. 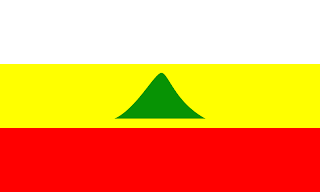 During this time, the tricolour was altered to be yellow, white, and what looks like grey. 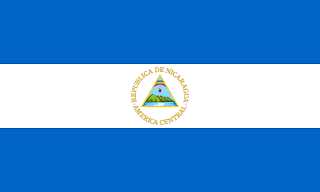 The naval ensign placed the words "Republic of Nicaragua" through the central stripe. With Walker forced out after a farcical election where he declared himself president, and the subsequent uprising by the conservatives, the flag returned to the tricolour of old, of blue, white, and blue. But the national crest was removed. From 1873 to 1889, the flag returned to the yellow, white and grey tricolour, then moved on to a flag with 5 stripes of blue, white, red, white, and blue. The flag was inspired by Costa Rica who had intervened in Nicaragua at the time to bring stability, and was an attempt to bring unity between the liberals and conservatives. From 1893 to 1896, the liberals rose once more, led by Zelaya. His government brought back a blue, white, blue tricolour. In 1896, a new national coat of arms was placed in the centre. 4 mountains on the ocean, within a triangle, with a cap of liberty. The mountains representing the old Federal Republic. With axes and poles behind the triangle, and the whole being surrounded by laurel branches. From 1898, the coat of arms was altered, with the surround being removed, and just the triangle remaining. Around the top was included the text of the Republic of Central America. In Spanish. Underneath, and crossing into the blue, are 5 gold stars. 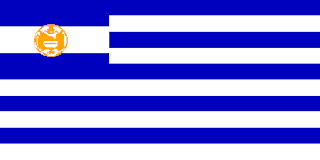 In 1898, the flag reverted back to the flag in use before, then moved on to the flag that is in use today. The flag in use today was formally adopted in 1971! It features the triangle in the centre, with 5 volcanoes representing the old Federal Republic, and the hope that one day it would be re-formed. There is also the cap of liberty, and the suns rays represent a bright future. There is also text round the crest to the Republic of Nicaragua.